This editorial is written by Christina Kelly, a 30-year-old practitioner who began her aikido journey six months ago. Christina, a Harvard graduate, has written editorial for leading media companies such as ESPN and Blizzard Entertainment. This is a story about hope, compassion, and the importance of aikido’s spirit of peaceful reconciliation. We are in the middle of a very interesting time in human history. It’s true that violence overall has declined massively from the days of human sacrifice and laws that enshrined dueling to the death as a legitimate way to resolve grievances. However, we still find ourselves in a world where it seems harder and harder to communicate and collaborate with people who don’t share our views, and where people can still become victims through no fault of their own via terrorist attacks or bombs that were not carefully deployed in wars. The human race desperately needs a philosophy that can teach us empathy for each other and demonstrates that even adversaries can work together for a greater good. In other words, it’s the perfect time for aikido to shine. As a 30-year-old first dan black belt in taekwondo, a more conventional punch-and-kick kind of martial art, I initially felt out of my element when I started training in aikido six months ago. Why were we learning about the subtleties of skeletal joints and the muscular system? Why were we practicing five different ways to fall out of a throw? Why were we trying to close the distance to our opponents and adopt a “flow” style of technique rather than standing firm against them? The answer came when I started researching the origins of aikido. From my longtime study of the Chinese language and writing system, I saw that the term “aikido” in kanji translated to something like “the way of uniting forces,” where the forces that were being united weren’t those of best friends or even regular strangers, but two opponents potentially engaging in physical combat. It turns out that it takes a fair amount of knowledge of anatomy and physics to determine how to safely position oneself against an attacker and be in a position to employ a technique. 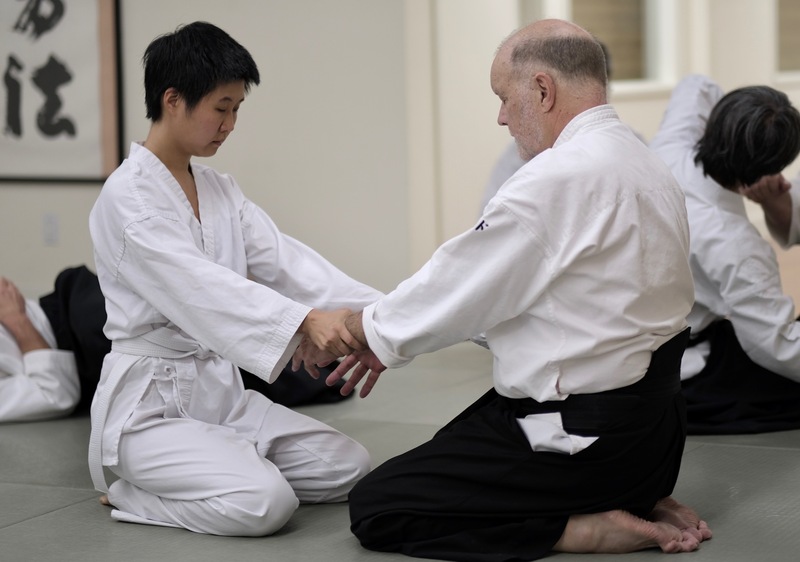 Since this knowledge can only be gained through experience, it makes sense that aikido practitioners join forces to show each other how to apply techniques on various kinds of people. I don’t know about you, but if someone threatened to attack me physically, the last thing on my mind would be the idea of uniting forces with them, even if I’d rather be friends with someone than enemies. And yet, aikido teaches that this concept is the key to effective self-defense, both in practice and in the real world. In this framework, success wasn’t just about disabling an opponent quickly, but doing it in the most humane way possible. It takes a lot of extra work to do it right, but it leaves the door open for reconciliation and understanding when an attacker realizes that you’re going the distance to prevent serious harm to them. This is the same spirit of aiki, because we are showing care and concern for the attacker’s well-being and thus working with them to achieve a mutually beneficial outcome where excessive violence is avoided. Genetically, humans are on average 99.5% similar to each other. But looking around, we see that people come in all shapes and sizes, ages, health status, etc. If we do not take these differences into account – that is, if we can’t intuitively appreciate other perspectives than our own – lots of problems and injustices can result. In aikido, I’ve learned that people differ significantly in terms of joint flexibility, body mass, muscle tone, strength, and more because I have actually twisted their arms or been pinned on a mat by them. An approach that might work for an opponent who’s 5’9” and 140 lbs. may be totally ineffective on someone who’s 6’3” and 200 lbs. It’s OK to fail the first time or multiple times when trying out a move on an uke, even on a kyu test, because we all know that it’s more important to show you can adapt a technique to new or changing circumstances than to get it right the first time. Everyone’s life force, or ki (qi in Chinese), is subtly different from moment to moment as well as from one person to another. If we think we can handle every uke or opponent the exact same way, the fight is already lost. Once you start to feel out and adapt to someone else’s ki, it’s impossible not to attain a better understanding of their perspective. 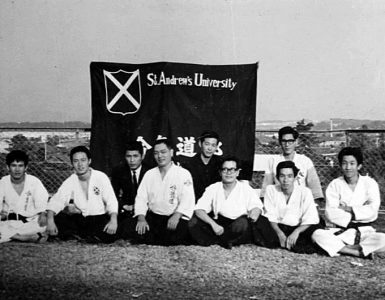 The traditions of aikido communities create safe environments to essentially engage in intentional combat and help smooth out the potential pitfalls of this approach. We bow to each other deeply to show respect and assure that we are aligned in our recognition of each other’s inherent worth as human beings. It means that although I’m just a beginner, I can trust that my second dan class partner won’t judge me for needing to go slowly through a new technique. Although we are on different places in our training, we are still both people who deserve to be honored and respected by others. When I feel that unconditional acceptance and regard for my abilities in aikido, novice though I am, it makes me more likely to pay that feeling forward in any situation where I’m an expert helping others learn about my passions. It’s a pebble thrown into a lake that starts an ever-expanding ripple of harmony and peace. Christina Kelly with Ted Rose. A big problem at this moment is that hate seems to be rippling out much faster than peace across the world through global communications media and political posturing at the highest levels. We need a way to stand up to this growing emotional catastrophe in an intelligent, empathetic way – not fighting fire with fire. Even if I never attain a high rank or perform a perfect ikkyo, I have learned something very important from this community and martial art: hope. We aikidoka all have the light of peace burning inside of us – a pilot light that may strengthen or weaken, but never goes out. We are both the stewards and the substance of this philosophy, for aikido would not exist if no one practiced it, and it would die a yet more painful death if its acolytes didn’t maintain its spiritual integrity while adapting it to a new era. We must act to foster aikido’s growth and continued existence, not just to preserve a unique and amazing human invention, but also to show the world that an opponent need not be an enemy; that differences of opinion can be handled in mature, thoughtful ways and not just by using angry words and the threat of war. As 2017 comes to a close, I’m sure many people out there besides me are taking stock of the year that was. It’s easy to make a list of grievances and write off these 12 months as evidence of growing chaos and disorder in the world. But when I think about this past year, I want to remember feelings of inspiration, community, indomitable spirit, and optimism even in the face of long odds. I am profoundly grateful to Ikazuchi Dojo and the greater aikido community for illuminating a well-worn but hidden path from negativity to positivity, despair to hope, and isolation to empathy. I intend to spread the word to my friends about the vision of aikido and the kind of world we’re fighting for, and I invite any and all aikidoka to join me in this effort in their own lives. To paraphrase a famous song, we don’t need more confusion and division in the world – what the world needs now is aikido. Thanks Christina for your insightful and well expressed article. 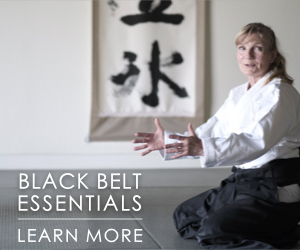 You have named many of the things I experienced when starting aikido training about 4 years ago – I appreciate you bringing back the clarity from a beginner’s eyes of what is here. It can be easy, sometimes, to not see what is there in practice, to take for granted the container that aikido is and what is possible to develop within practice of us. You said, “We are both the stewards and the substance of this philosophy” – I like how this simply brings home how each of us is connected in our individual practices and dojos. Much appreciation. Thank you for your comment! It reminds me of the concept of “beginner’s mind” in certain meditation or spiritual practices. I also believe that intentional application of this concept can help people think outside-the-box and engender more appreciation in our daily lives. Thanks for pointing this out, and the stewards/substance line – I was proud of that one :D.
God bless. I came to improve my fighting skills and was confused. Later I came to realize that Aikido teaches a tangential approach to conflict. Easier lessons come from John Boyd – Observe-Orient-Decide-Act: whoever goes through the cycle fastest wins. Or Douglas MacArthur – “Hit ’em where they ain’t”. Even George Patton – “Always advance”. US Grant said, “The one who attacks longest wins.” These are all easier and relevant to Aikido, at least imo. The subtlety in Aikido helps deal with size disparities… IF it ever comes to that. As my old sempai Tom Everett used to say, “The world needs more lerts. Be a lert today.” Boyd disciples use the term “situational awareness” for the Observe and Orient parts of the cycle. At least in my experience, superior awareness avoids almost all situations. Predators don’t want to work for a living or they would get a regular job. If they know they’re detected, they will almost always pick another victim. Terry Dobson Sensei wrote two books – Giving In To Get Your Way and https://www.amazon.com/Safe-alive-yourself-property-violence/dp/0874771897/ref=la_B000ARBGJM_1_3?s=books&ie=UTF8&qid=1513793165&sr=1-3 (which I haven’t read, but recommend out of respect for Dobson Sensei) As for the down and dirty, Aikido techniques are not inherently injurious. Daito ryu techniques from which they are derived tend to be. If there are no injuries and you’re in control of the situation your legal situation will be simpler. Very interesting post, I have been practicing Aikido since 1975. I truly believe that Aikido is a great vehicle to teach life skills of co-operation and kindness through working as tori and uke. Thanks for your comment! I can’t speak for the whole dojo, but I can say that over the past 6 months I’ve really felt that the Ikazuchi staff and the community support the values and vision I described in the piece. I love the paraphrased Shakespeare! Thanks. Interesting to get a taekwondo perspective on Aikido. I came to the understanding a long time ago, that the task is to change oneself, as the job of changing everybody in the world is to big for the one person. Aikido gives us the tools to develop our selves as human beings, and be the best example, to others, you can be. Aiki is not the only path, or the easiest, but I find it fun. yours in Aiki Pat. Beautiful point of view Patrick. As a practitioner of Gao Baguazhang, Hebei Xingyiquan and Taijiquan the focus is looking inward to yourself to correct any errors. Dissolving blockages, Dropping the qi through relaxation (Sung) and correcting self ignorance gives peace of mind and the feeling of freedom leaves no opening for attack. A Gao perspective might say “I have whole body power and am the “ONE” while inside they are seperate and have internal “errors” which they are not aware enough to yet correct. Their freedom is their responsibility. This is very insightful – thank you for your comment. 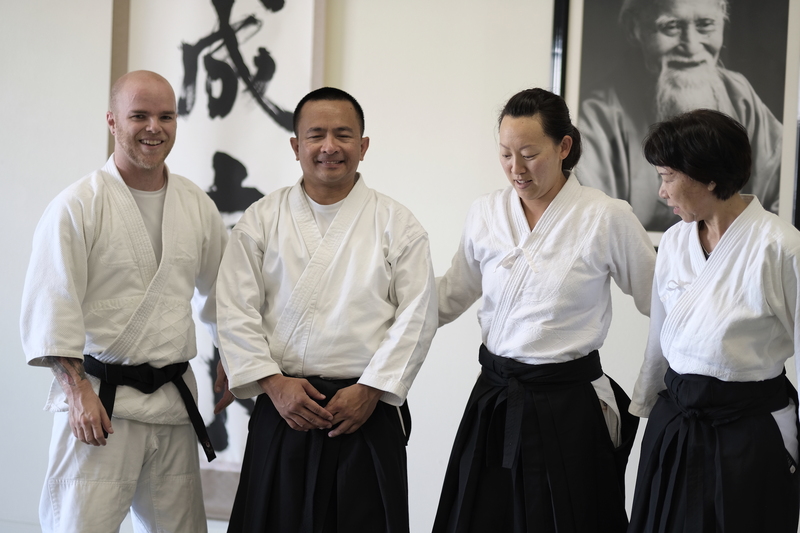 I agree that aikido is a fun path to self-improvement and change, but I also think in a sense it’s one of the easiest, because, at least for me, having a structured learning environment and supportive community facilitates this effort in significant ways. I’ve done a lot of work on my own to understand interpersonal communication/empathy and apply it in my everyday life and work, and having something like aikido to guide the process is very helpful. 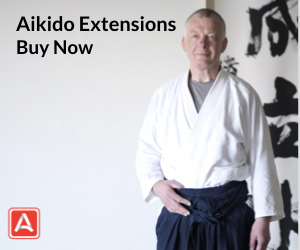 That is one of the best articles on Aikido that I have read! Well done and thank you! Wow, I’m so honored by your comment! Thanks! Wonderfully thoughtful article Christina, you reminded me of the hope and possibility that struck me when I entered my first aikido dojo 45 years ago this month. You illuminate us with Shoshin – your brilliant beginners mind. Reconciliation – we must learn it and exercise its power if this world is to survive. You remind us that aiki practice puts this spirit in our bones and marrow. Thank you. Very nice reading and perspective. Impossible not to agree with you, Christina! Aikido practice is a real catalyst to more compassion and empathy. I understand all of this, but I have one question. Why not MMA? 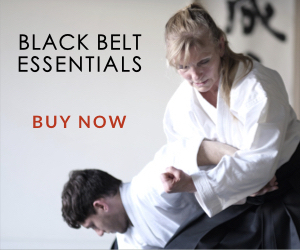 It teaches self defense that works hundreds of time better than aikido, and learning how to double leg and mount someone is a human way to defeat an opponent. It also teaches people how to hold back via sparring, most schools do hard sparring at most once per week, and the majority of the time it’s light sparring. A lot of people have a preference for an art like aikido over MMA due to the differences in community, culture, etc. Many also don’t prioritize self-defense efficacy as highly as some of the other aspects of aikido practice. However, you make a great point. A double leg takedown to mount is used in MMA, BJJ, and a number of other martial arts. It’s a high percentage technique and does allow you to control someone in a humane way. I often wonder why we don’t incorporate successful techniques, tactics, and training methods from other systems into aikido that both satisfy our principles / philosophy and have also higher levels of practicality. After all, all of the aikido techniques were originally taken from Aiki-jiujitsu, and many of those techniques were most certainly taken from, or developed in parallel with stuff from other systems. Sport combat people were using sankyo back in ancient Greece. 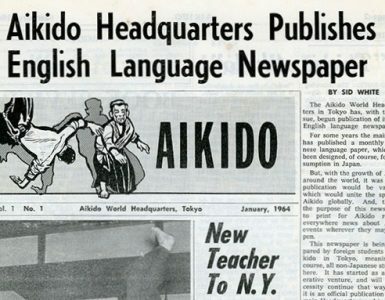 The question you ask is an important one, and hopefully one that the aikido community will find increasingly compelling ways to answer as our generation continues to rediscover aikido, which I believe must be done with each generation. Thank you, Christina, for an article that bridges the mat and the world. Aikido practice helps us embody empathy, hope, and a way to drive the energy of disparate forces to a higher level. Good ki! 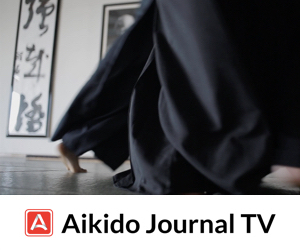 Nice article on Aikido. Keep good articles coming.